You must authenticate a customer in your system with Alexa when you respond asynchronously to a directive or when you send change reports to the Alexa event gateway. You provide the authentication information in a scope in the event message. This document describes the process for obtaining and providing the authentication information for a customer when you send messages to Alexa. When a customer first enables your skill that has permission to send messages to the Alexa event gateway, or a previously enabled skill is migrated from v2 to v3, Alexa sends a message called an AcceptGrant directive for each customer. An AcceptGrant includes a bearer token that identifies the customer in your system and an authorization code so you can obtain credentials for that customer with Alexa. You use the authorization code provided to call Login with Amazon (LWA) and retrieve access and refresh tokens. The following image shows the process of authenticating a customer and sending messages on their behalf. Each time you send an asynchronous response or a change report on behalf of that customer, you include the access token in the scope of the message to the event gateway. The structure of the message is the same as for a synchronous response, but you send the messages to the event gateway. NOTE: You should always follow OAuth 2 best practices when storing and sending authentication tokens. This means that tokens and other identifying information should be stored and exchanged in a secure manner. You should exchange the authorization code for the access and refresh tokens right away, as the authorization code has a limited validity period (a few minutes). Once the authorization code expires, the customer must disable and enable the skill again, so a new authorization code is generated and sent to your Lambda function with the AcceptGrant directive. You must store the access and refresh tokens for a customer and include the access token in each asynchronous or change report event. Before the token expires, you should use the stored refresh token to get new access and refresh tokens. Note that per LWA guidelines, access tokens are valid for 60 minutes. 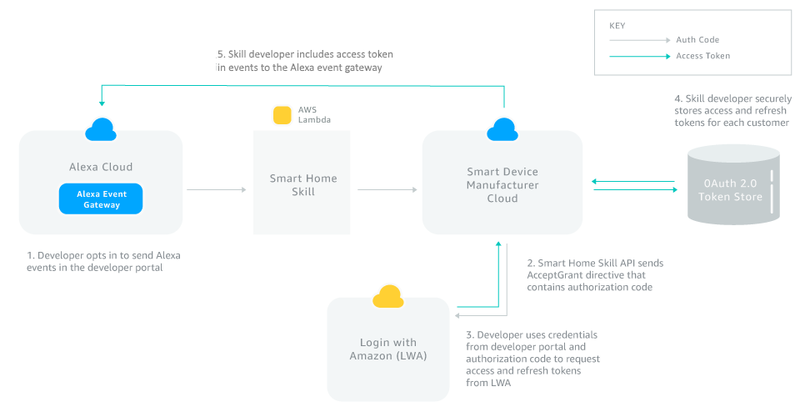 In addition, when a skill is migrated from v2 to v3, and you have requested permission to send events to the Alexa event gateway, there is a backfill process and you will receive an AcceptGrant directive for every customer that has enabled your skill. Be prepared to receive these messages and complete the authentication process. Sign in to the developer console and select the skill. On the PERMISSIONS page, slide Send Alexa Events to indicate your skill will send asynchronous responses and/or change report events. In the Alexa Skill Messaging section that appears, note the Client Id and Client Secret in this section, as you will need these values to request an access token for a customer. The following image shows the permissions slider, and an example Client Id and Client Secret. Add code in your Lambda function to handle an AcceptGrant directive. You will receive one every time your skill is enabled by a customer. Following is an example of the AcceptGrant message. For more details about the AcceptGrant message, see the Alexa.Authorization interface. A skill needs to be enabled and account linked to an account in your system before the AcceptGrant message is sent to your skill. See Test Your Skill for more details. Return an AcceptGrant.Response for each AcceptGrant directive you receive. If an error occurs, you should return an ACCEPT_GRANT_FAILED error response. Enable the skill for testing on the Test page in the developer console. In the Alexa app, enable and account link the skill. Upon successful linking, the AcceptGrant directive is sent with a valid authorization code. Use the value in the code field of the AcceptGrant directive to send an access token request to LWA to retrieve an access token. Send the secure HTTP POST to https://api.amazon.com/auth/o2/token with the parameters listed in the table. For more information, see the Access Token Request topic in the LWA documentation. grant_type REQUIRED. The type of access grant requested. Must be authorization_code. code REQUIRED. The value for code provided in the AcceptGrant directive. client_id REQUIRED. The client identifier. Will be provided in the Permissions section of the developer console. client_secret REQUIRED. The client secret. Will be provided in the Permissions section of the developer console. Note that although the LWA documentation is ambiguous about whether a redirect_uri is required, it is not and you should not include it in your request. If you lose the access and refresh tokens associated with a customer or customers, you will need to request new ones using our backfill process. Use the contact form on the Developer Support page to start the process. When you submit this form, you will be added to a list and we will resend AcceptGrant directives for each customer that has enabled your skill. Email address: Provide an email address for a developer account associated with your skill. Message: Request an authentication backfill for your skill, and provide your skill ID. Backfill requests will be processed once a week, and you should be prepared to receive authorization codes for every customer that has enabled your skill. You could receive up to 10 transactions per second, and if you cannot handle that number of messages, you should let us know in your contact request. You must send synchronous events until the backfill completes as any responses sent to the Alexa event gateway will fail. If you send a message to the Alexa event gateway with an expired token, you will receive an HTTP 401 Unauthorized response. For more information, see Error responses from the gateway As a best practice, before the access token expires, you should use the refresh token to request new access and refresh tokens from LWA. Per LWA guidelines, a token expires after an hour. For details about how to use the refresh token, see Using Refresh Tokens in the LWA documentation. Important: When you use a refresh token to obtain a new token from LWA, the old token remains valid until it reaches its expire time. A customer explicitly removes consent for the skill by accessing the Your Account > Manage Login with Amazon page of their Amazon account. You get a HTTP 403 when you send an event with a token that has not expired. This happens when the skill is disabled or a customer removes consent, but the token you obtained has not reached its expiration time. "description": "Skill is disabled. 3P needs to specifically identify that the skill is disabled by the customer so they can stop sending events for that customer"
You are not able to refresh a token. In this situation, when you try to refresh the token, you get an invalid_grant error code from LWA. This is a permanent state and indicates that the authorization has been revoked by the customer. For more information, see the Access Token Errors section of the LWA documentation. When a customer removes consent, the authorization grant is revoked and your skill is denied access to some or all resources associated with the customer account. You must have logic in your skill and supporting systems to stop sending events that rely on the grant, such as asynchronous messages to the event gateway. Other parts of the skill must function as normal.